Pole-mounted distribution transformers are mounted above ground on poles. These transformers are manufactured to standard designs, primarily for power distribution companies. These transformers typically service urban and rural residential and commercial loads. 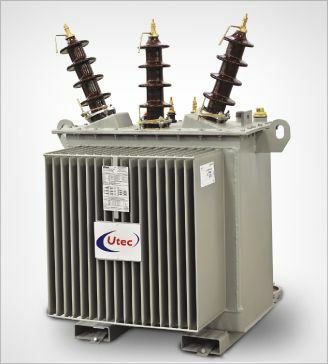 Utec’s Pole Mounted Transformers are oil immersed hermetically sealed type which are designed, manufactured and tested according to IEC 60076 and its equivalent standards. The tank is designed to accommodate expansion of oil during loading through the use of corrugated steel sheets. The Primary bushings are provided on the bolted top cover, while Secondary bushings on side wall enclosed by air insulated cable box. Both Primary and Secondary bushings can also be provided on top cover as per required specification. Compact design, Low-noise and light in weight. Overload capability in compliance with IEC 60354. Sealed construction to prevent moisture entry. Extended creepage HV bushings as standard execution.